ASUS (2353) isn’t giving up on the smartphone/tablet hybrid dream just yet. Ahead of its official October 16th announcement in Italy and Taiwan, the reliable Evleaks has dumped several images of ASUS’s Padfone 2 on its Twitter account. From the looks of it, the Padfone 2′s tablet portion exchanges previous models’ rear door flap for a easy slide-in dock mechanism. The tablet dock also sports a tapered wedge design. Rumored specs for the Padfone 2 smartphone include a 4.7-inch display (1280x 720), 1.5GHz quad-core processor, 13-megapixel camera with LED flash, 2GB of RAM, Android 4.1 Jelly Bean and LTE connectivity. 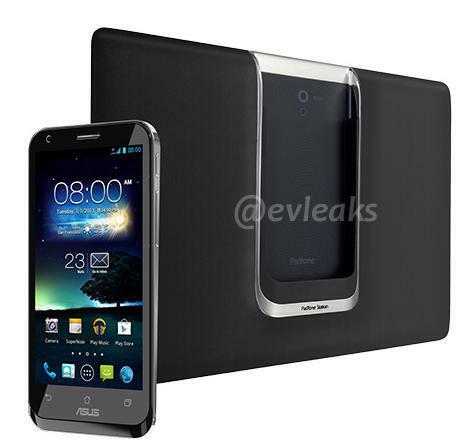 Evleaks’ Padfone 2 images follow below.